February this year is an Artist in Residence month for me. The last time I did this was May 2013 – you can read about my adventures from that year here. I felt it was time to do it again. 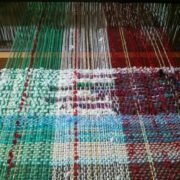 For those that didn’t read my blog then, it was a time for me to focus on my weaving as an Artist in Residence – in my own residence and studio. 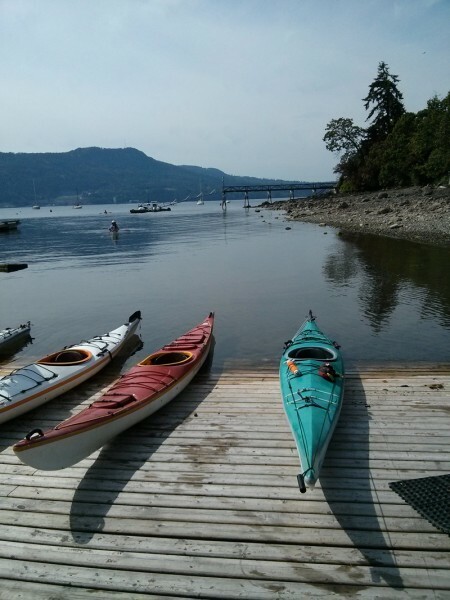 So this year’s residence started with a SAORI Kai over in Victoria at Knotty by Nature. 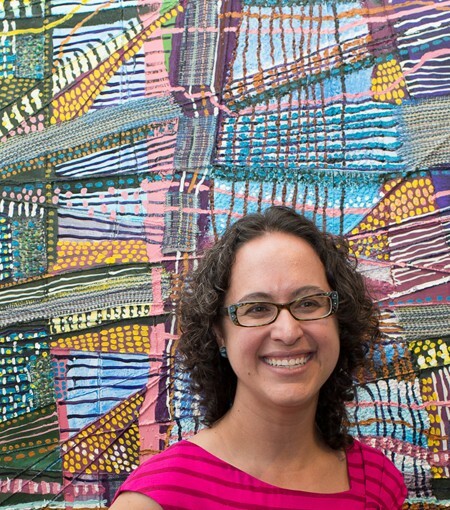 What a great way to start out – sharing our SAORI stories and inspiration. Some new and visiting people were there which added to the Kai. Thanks to all who came!! As I start on this next Artist in Residence (AiR), I’ve been wondering what my focus will be. 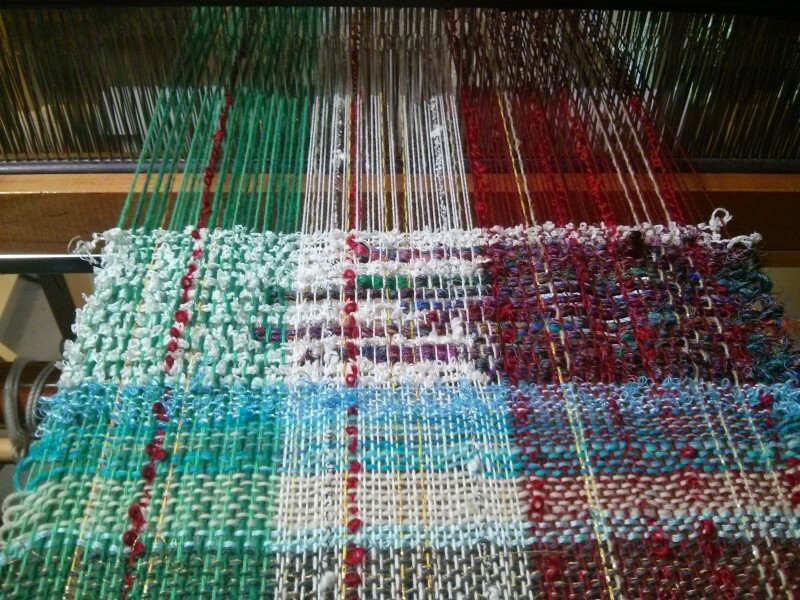 This was a warp I put on before Christmas thinking that someone might like to weave something in Christmas colours – or that I might. 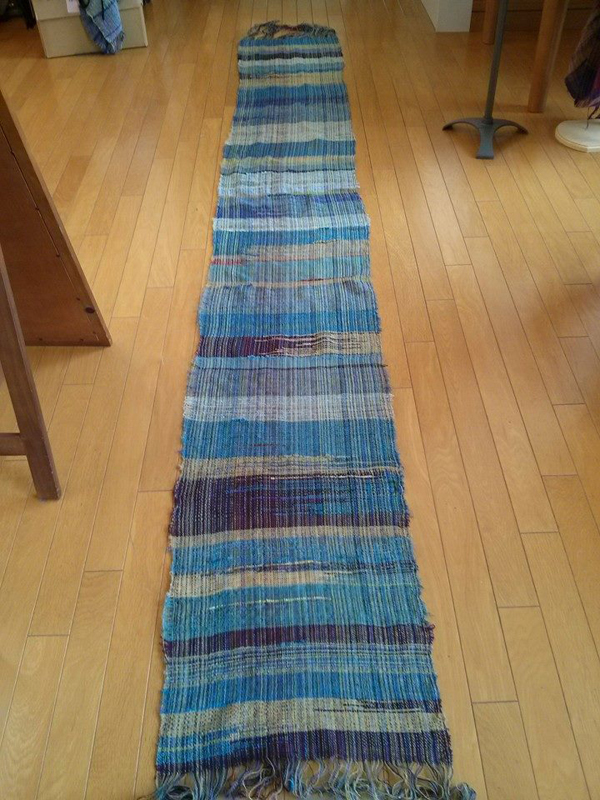 One person did a weaving, but then there was still lots of warp left. I wondered – how can I weave this so that it doesn’t look like ‘Christmas’? It’s interesting that I have this feeling as I start out that I have to clear all my previous warps before I start on some new things. Making space perhaps for new ideas. 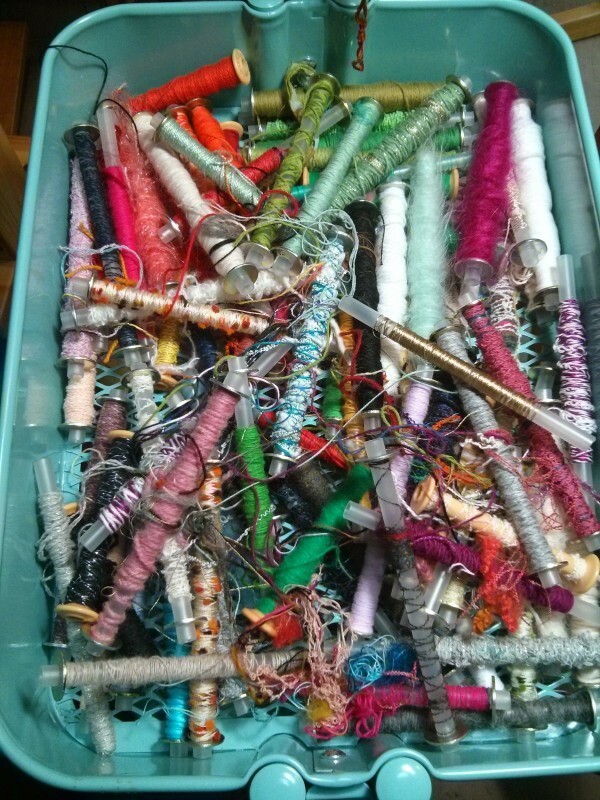 I also wound some new warps yesterday – so I’ll just let this process unfold and see if it becomes clear. 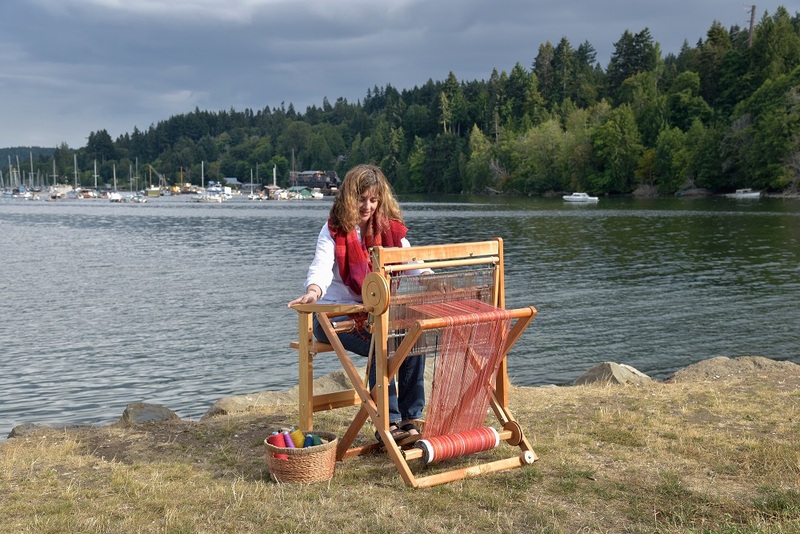 During this month I have a workshop in White Rock and another in Victoria at Pacifica Paddle in Brentwood Bay – great chances to share SAORI weaving. I also have people coming to the studio to learn, to share. This is what I love – sharing SAORI! 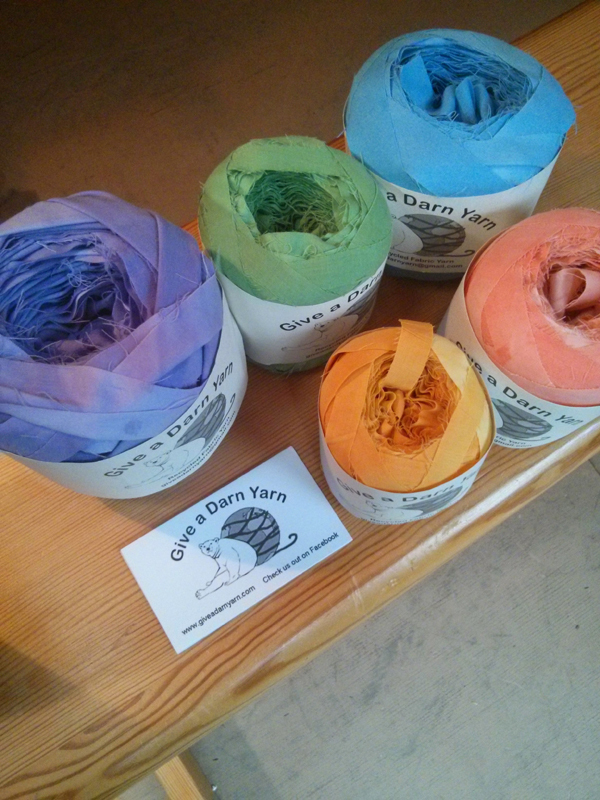 Some beautiful rovings from Ashford and of course some of the SAORI Yarn Sets that came just before Christmas. And some new yarns that I’m hoping arrive soon from New Zealand from Black Hills Yarn which I will be carrying in my shop! I’ll keep posting my explorations…. 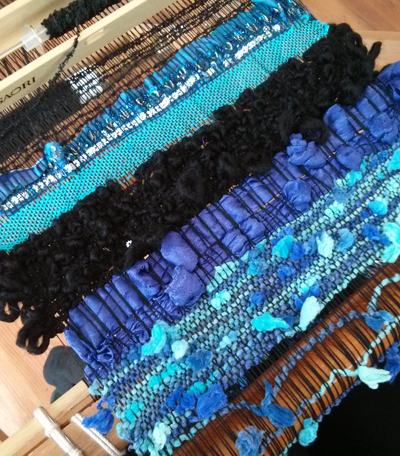 Thank you so much to Doneal, Noreen, Gabriella, Judi, Lynn and Tanya for sending in photos of their SAORI weaving! I love seeing what people are creating and hearing the background and thoughts behind a piece. Thanks also to everyone who ‘liked’ a post on Facebook or commented on the posts on the blog. So, I thought I’d show my latest piece to wrap things up – the “Memories of Peru” red weaving. I have it hanging over a large mirror in our hallway right now for Christmas. I’ve tried multiple times to take photos of it – tricky with the mirror. The weaving is 12 feet long and drapes across the top and down both sides of the mirror as you come in the front door. Here it is in sections draped on a chair so you can see it better. 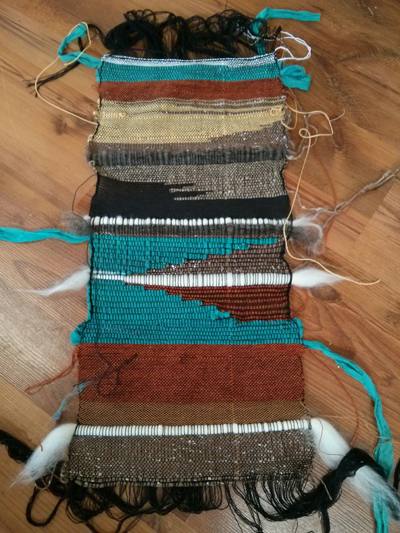 There’s a section in here that I call ‘red road’ which is kind of a pathway and journey section of the weaving. 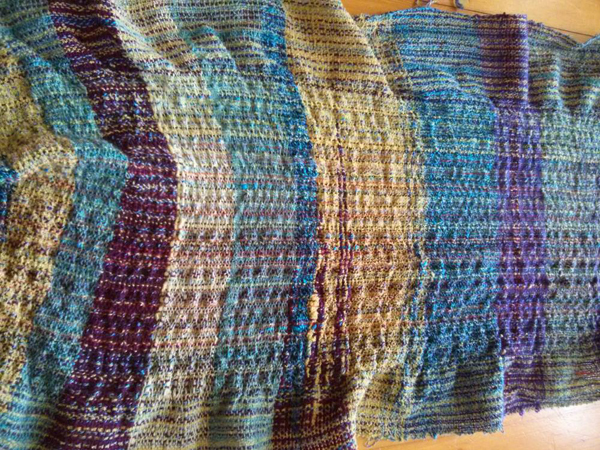 After Christmas it may be destined for some clothes or it may stay as a wall hanging of sorts. We’ll see. Now, I’m back to a blue warp – surprise!! SAORI Kai II – Oh Christmas Tree! SAORI Kai II – Dragonflies & Spirals Oh My! So, I heard from Tanya yesterday that she was going to send in some photos of her current work in progress – so I thought I’d wait for it. She calls her piece “Chocolate Mint” – and that sounded worth waiting for….. Here are some pictures of the chocolate weaving I am working on. 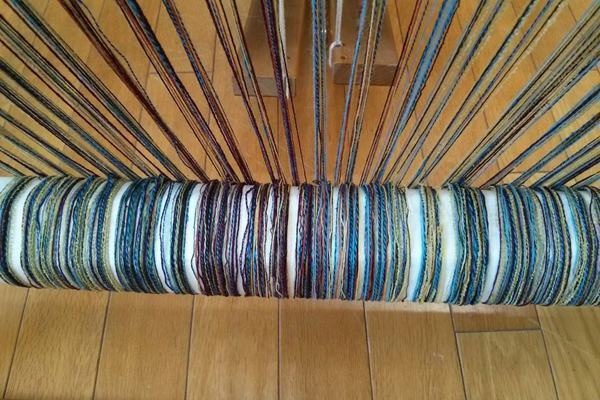 This warp has been waiting to be used for a while and was originally intended to be for some pillow covers. But the dark chocolate brown made me change my mind. It’s mostly alpaca, cotton, silk and bamboo, with a few odds and ends thrown in. 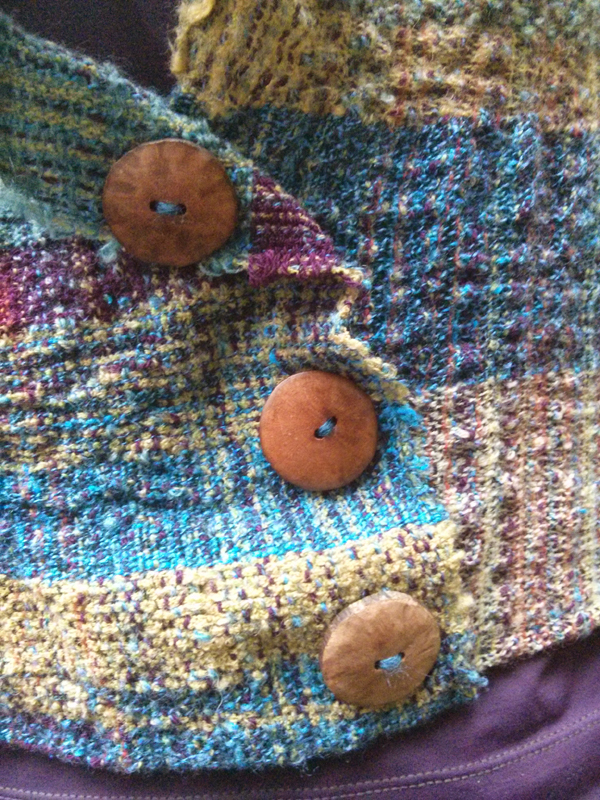 It’s very lush and soft and I look forward to wearing the resulting clothing. 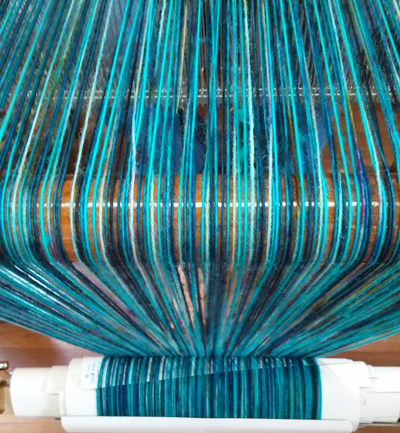 The warp had a bit of green and teal/blue in it that come through and I’ve used a teeny bit of green also in the weft here and there. Weaving in front of the fire in Jasper was really lovely. Weaving, chocolate, being in Jasper, by a fire – sounds like a wonderful time – and the inspiration is certainly coming through the weaving. This is really wonderful Tanya – I look forward to seeing the finished piece and what it will become! Of course there was chocolate to eat before you could use the ribbons…..yum…..I’ll bet this will inspire some others! Welcome to the SAORI Kai Lynn – I always love seeing your clothing! This is a top that I made quite some time ago. I love the design, so simple with just 2 pieces sewn together with the top one a bit longer – folded to make the sleeves. The bottom is folded around to make the front. The fabric is cotton with bits of treasures here and there. But, I didn’t wear it much as I didn’t like the way it hung on me. A little too small. Then a few weeks ago I was cleaning up my studio, emptying baskets, rearranging yarns and finding some of the first SAORI weavings I did years ago. I found a narrow strip of dark red, purple, a touch of yellow and blue. It just jumped out at me! I looked at it for a few days, thinking of how I could incorporate it into something I could wear. There was my neglected blue and red shrug, sitting forlornly waiting to be decorated for Christmas. It is the perfect collar! Now it fits, hangs beautifully and keeps my neck warm. I love the way SAORI has become such an integrated part of my everyday life. The way I cook, the way I garden and the way I create. Thank you for having the SAORI Kai Terri. I am always so inspired by seeing what others create. Thanks for being part of the Kai Lynn! I love how you are so often re-using, re-purposing and re-designing things to work for you. You have often said that you want to be able to wear the things you make and so the designs have to work for you. I’m so glad that you found a way for this one to work for you – when I saw it the other day it looked like a whole new top! 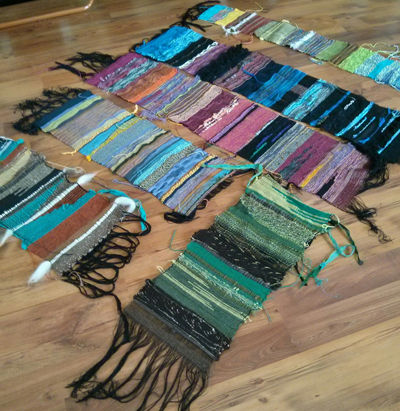 Judi started SAORI weaving in September and I have seen some of her work on Ravelry. I love these trees and am so glad that she is sharing them in the SAORI Kai! 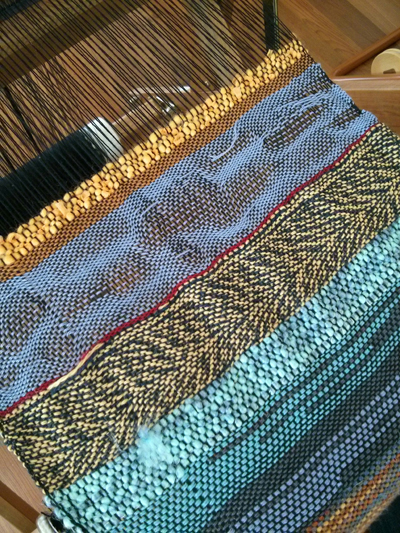 When I first heard about Saori weaving I was intrigued. I ordered a book from Terri, and when it came I read it cover to cover. I was speechless. After knitting for 45 years I had, over the last few years, had a niggling suspicion that all I was doing was the fibre equivalent of paint-by-numbers. I didn’t feel creative; just productive. I had played a bit with a rigid heddle loom, but it was to try traditional techniques which didn’t speak to my inner artist either. After reading the book over and over, it was as though the curtain had been lifted. The Saori philosophy was just what I had been seeking. 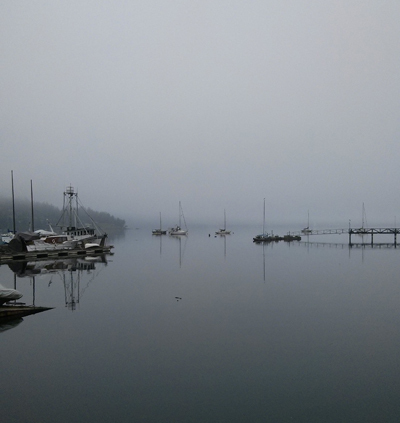 Then, this past September, I spent a few days on Saltspring in Terri’s studio and my fate was sealed. A loom arrived at my house shortly after I got home, and hardly a day has gone by since that I haven’t sat at it and woven. I have made scarves, fabric yardage (some of which has been used in construction and some of which is waiting. Not sure what for, but it is waiting.) and my favourite so far, wall hangings. These Christmas trees grew quickly, with no overall plan, from somewhere in my heart, and I suspect that there are many more little “pieces” waiting to emerge. 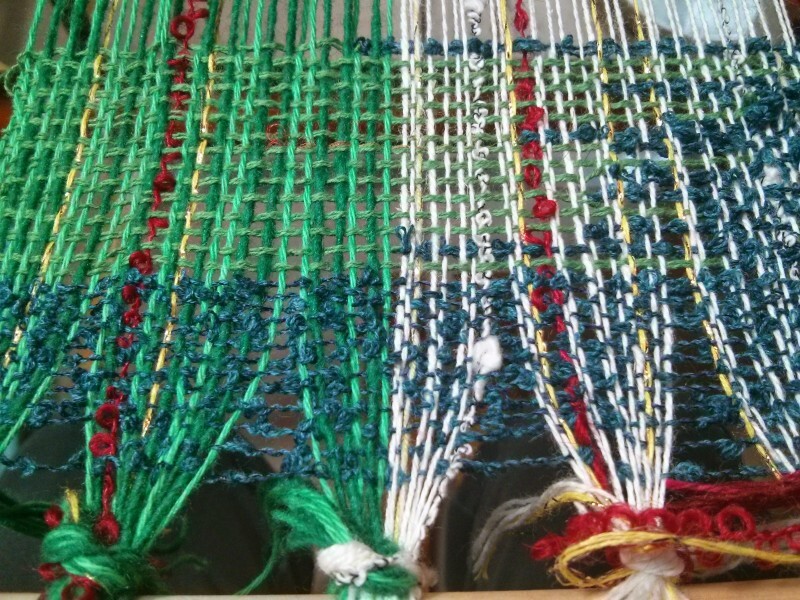 I love that there are no Weaving Police, and that many of the traditional techniques I taught myself can be used nicely in Saori. 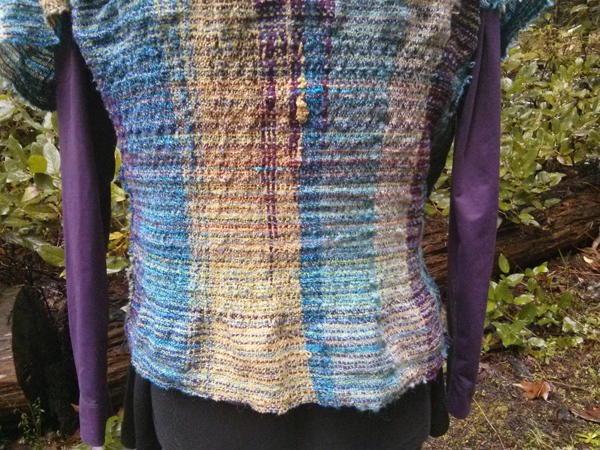 I am so enjoying playing with fibre and texture and colour, and I love that everything I make is one-of-a-kind. When I weave, the Saori philosophy is never far from my mind, and I find it incredibly exhilarating, like walking on a beach in a big storm; wind and rain in my face and hair. 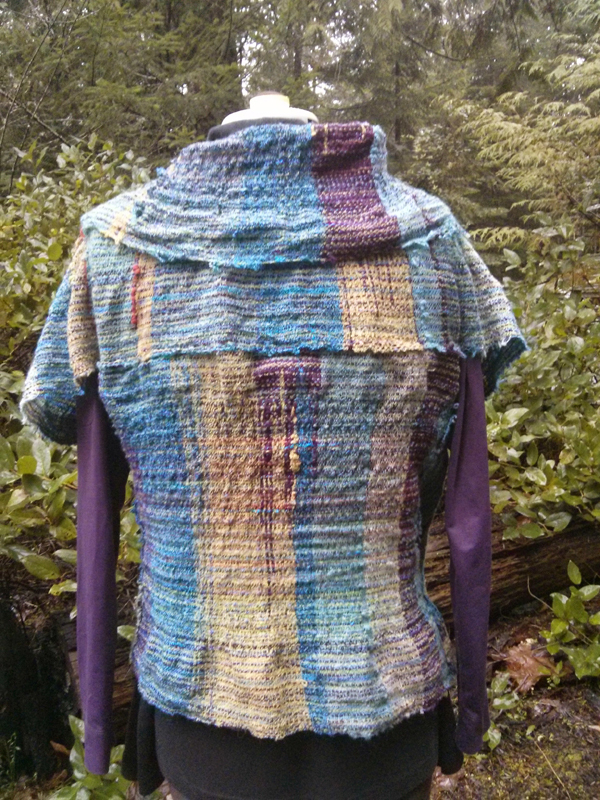 If you are part of Ravelry, you can see more of Judi’s work on her project page here. 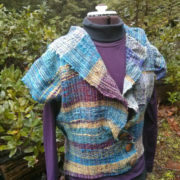 http://saltspringweaving.ca/wp-content/uploads/2016/11/SAORI-Salt-Spring-logo-1-1030x158.jpg 0 0 Terri http://saltspringweaving.ca/wp-content/uploads/2016/11/SAORI-Salt-Spring-logo-1-1030x158.jpg Terri2012-12-16 14:23:582012-12-16 14:23:58SAORI Kai II - Oh Christmas Tree! 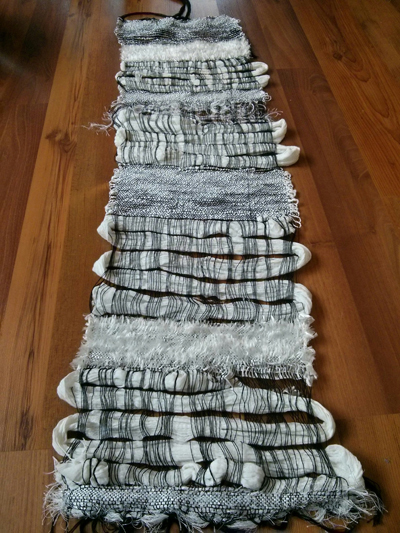 I’m sending you a photo of my first project as promised – I’m already almost done the second one and just loving it. I asked her if she’d like to be part of the SAORI Kai with her first piece and she agreed. 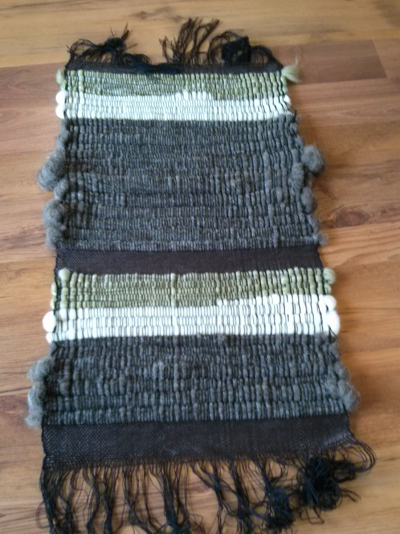 I think that you’ll agree that this is an amazing weaving! I came to stay for two nights at Honeysuckle Cottage. 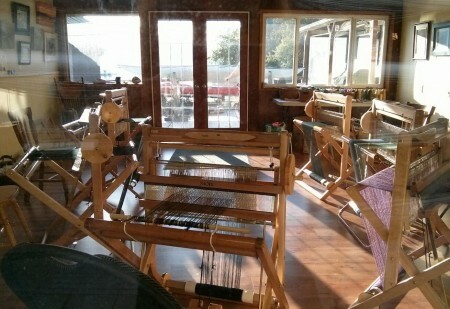 During my stay I did a bit of exploring and came across Terri’s studio & then ran into Terri who sat me down at a loom. That was the first time I’d ever tried weaving. I had a sense then that this wouldn’t be the last time and, sure enough, I had the opportunity to return later in the year, to spend more time learning how to weave. I said to friends, “this will either confirm that I want to do this or it’ll get it out of my system.” Two months later my Saori loom was delivered to my house and within a few days I’d completed my first tapestry. I’m working on my third tapestry now and looking forward to seeing where my weaving explorations are going to take me! I love the beads, the curving lines, the colours! Doneal has written in with the first post for the Virtual SAORI Kai II. 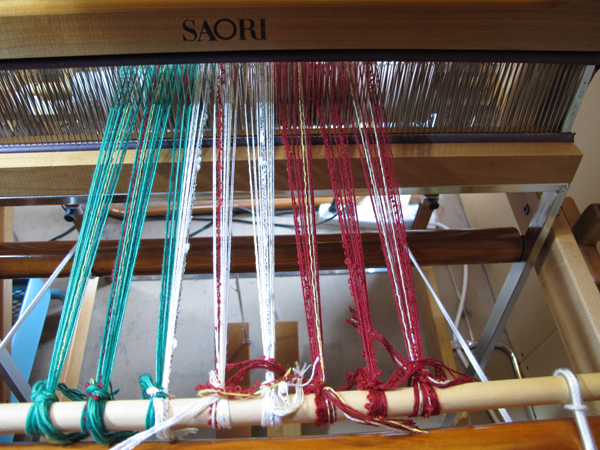 Earlier this year Doneal ventured from spinning into weaving when she purchased one of the new SAORI WX-60 looms. 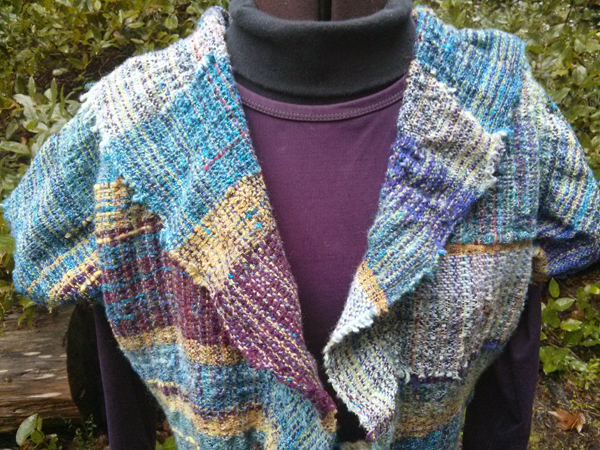 She has been using her handspun and other yarns in her weaving. I was surprised at the drape..maybe it was because of the skinny yarns in the warp but its really comfortable to wear..light but warm..
Beautiful! 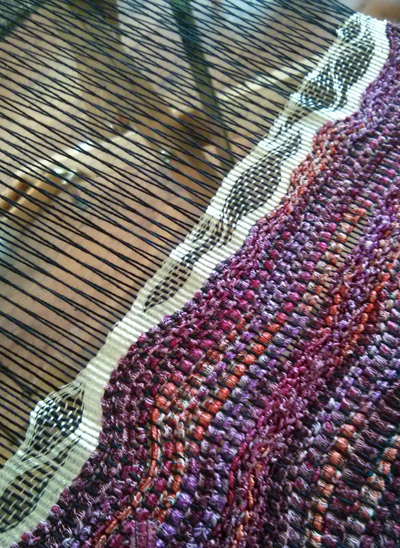 I really like the way it drapes too, the colours look so soft and the open areas of weaving really add to it.